Scheduled as a double header, featuring a full round of games in the Ulster Bank Premier League, followed by the second round of the Irish Senior Cup on Sunday. Five NCU sides made it through and with only two making it from the North West once again it’s Leinster sides with numerical ascendency. With the notable exception of Waringstown it has been a struggle to get past the 2nd hurdle for a number of years now; perhaps the worm is turning. However, there will be no easy tasks, Instonians having disposed of favourites Clontarf, are at home to Dublin side Pembroke and holders Waringstown face the journey to Eglinton, no pushover on their home patch. “Previously we may have been a little overawed looking at these fixtures, now we see it as an opportunity. We beat CI last year and the Irish Cup is an extremely prestigious competition we have not really excelled in. Over at Belmont, Saturday’s opposing captain, Nigel Jones was in happier mode than the last time we spoke; now with a couple of cup wins behind him and his own first significant contribution to the season with the bat. “I enjoyed last Sunday, firstly Justin Kemp, with the new ball, he was determined he was opening and there was no way I was getting it off him. “We haven’t seen the best of him batting, he looks good in practice and I think someone is going to suffer soon and that will make good watching, hopefully this weekend. “I have felt like I’m in good form with the bat, but up until now either I, or the bowlers have been finding ways to get me out, so yes it was good to get a solid knock behind me. It was also great to bat with young Karthik who made 55. “Looking forward to this weekend, with two good pitches, Carrick is a good place to bat and also rewards the bowler if you get it in the right areas. “We won’t be taking them lightly, they have match winners in the likes of Pat Botha, Jamie Holmes and Eagy, more than useful but should be a good game. “As you know the philosophy is very much one game at a time, we have Stevie Chambers and John Matchett back available again for both games. Jos McConkey will play Saturday and David Robinson on Sunday. If Derriaghy emerge victorious at Waringstown on Saturday, it will be the icing on the cake having downed both CIYMS and Donemana as Craig Lewis points out. “Probably the only match we have been expected to win was against Donaghcloney, so I suppose we are two games ahead of plan. “Big test this weekend, obviously our focus is the league, it would be great to win and we want to push them all the way. “The boys have impressed me so far, absolutely fantastic, the focus will be on our batsmen this weekend, making sure we bat 50 overs. 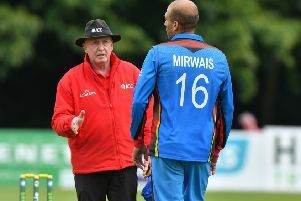 “Waringstown obviously have a top spin attack, but I think that our quartet of Curtis Moorhead, Wayne Hughes, Robert Cumins and Kaushik Aphale might relish having the bigger boundaries to bowl to as well. “I hear people are making us favourites against Co. Galway on Sunday.